This is the Team Valhalla 360 Plus Device. Frontal hyper-flexion is reduced by the front of the helmet coming in contact with the firm foam pieces of the device under the drivers chin. 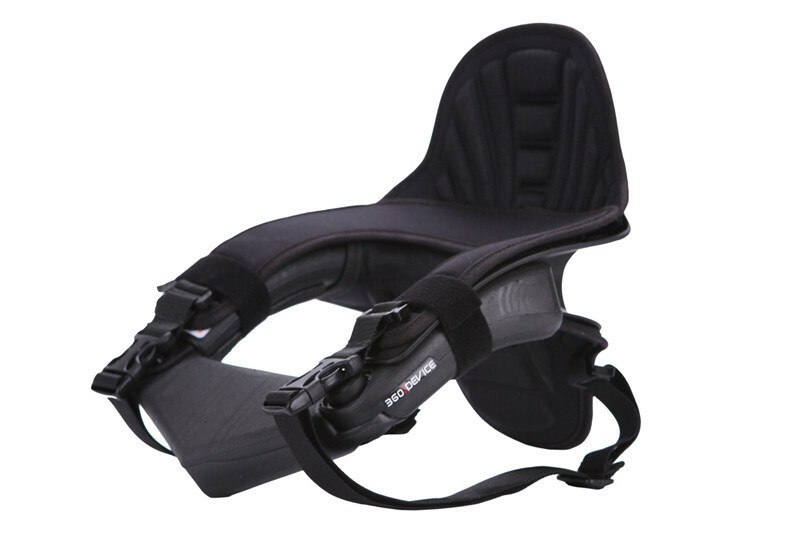 These components are constructed of foam that is much denser than the normal neck collar currently worn by drivers.The vertical braces of the core piece, located behind the driver's helmet, helps control the rear hyper-flexion. The helmet coming into contact with the upper vertical brace, located directly behind the driver's head, reduces backward movement. This engagement then transfers the energy to lower vertical brace located against the driver's back.Extreme lateral motion of a driver's head is minimized when the helmet comes into contact with the device. While not hindering the driver swiveling his/her head from side to side, the device provides a robust platform for the helmet to rest against as in a roll over situation. This is all accomplished while still allowing the driver unrestricted rotation of the head to look over the shoulder for oncoming karts. The foam pieces under the chin of the driver are much stiffer than the foam used in other neck collars that are currently available to the driver now. The denser foam allows for better control of the helmet movement. The 360 Plus Device is designed with foam parts in the front, verses plastic, to help minimize potential injury to the throat area if forced backward.Designed break away feature. In the bizarre event that something should hook inside the Device, the 360 Plus Device is designed to break away so that the potential for serious neck injury is reduced. The foam pieces are also adjustable - laterally, front to rear - to adjust for the different chest thicknesses of drivers.